Richard "Gill" Diethelm was born in Birmingham in 1968, the fifth of five children. 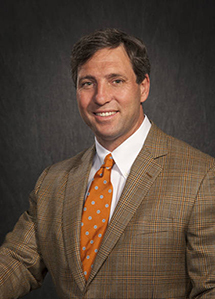 He graduated from Mountain Brook High School and then from Millsaps College and the University of Mississippi School of Medicine. It was in medical school that neurology piqued his interest. "I had the opportunity to follow Dr. Jim Corbett on rounds. Dr Corbett was a wonderful teacher, especially at the bedside. He never wanted to see the MRI scan before seeing the patient. And it seemed as though he never needed it. He made the diagnosis from the history and physical. His knowledge and command of neurologic disease fascinated me. I wanted to have that same knowledge". Following graduation from medical school, Dr. Diethelm went on to UAB where he did his neurology residency. "Once at UAB I saw how excellent care should be given, both in the clinic and in the hospital. I developed a special interest in headache. Under the tutelage of Dr John Rothrock, I found that the treatment of chronic headache is interesting and rewarding. The patients almost always improve, and sometimes, the headache resolves completely". "I see patients from age 12 and up. I want my patients to leave a visit feeling as though they were attended with thought and compassion. I am trying to provide excellent community neurologic care. If I don't have the capacity to help the patient, I will refer to another expert here in town"